We’ve had a lot of questions about prices sent to us here at Elliptical Review Guru, like what is the best elliptical under $500 or under $1000, but this one that recently came through is more general in nature: How much should I pay for a new elliptical? This is a very good question, and one that we’ve covered to some extent on our site. So here is a more comprehensive answer for those who aren’t sure how much they should be spending on a new elliptical trainer. For starters, it’s important to understand that there is no “should” when it comes to spending money. When it comes down to it, you spend what you can afford to spend. If someone tells you you should spend $2,000 on an elliptical, that is simply an opinion…it doesn’t mean that you can’t get a good elliptical because you don’t have $2,000 to spend. But there are general guidelines when it comes to prices for new elliptical machines and they will be very helpful during the buying process. For the most part, there are three different types of ellipticals at three different price ranges. You have your entry level ellipticals, your mid range ellipticals and your high end ellipticals. The entry level ellipticals are very basic machines that are built for light usage. These are ideal for the elderly, for rehabilitation purposes, or just for very basic use by one individual. Usually these machines are very compact, lightweight and bare boned. You might get a few resistance levels and a basic computer…you might even get a few built in workout programs. But that’s about it. There are no bells and whistles, extra comforts, added features…you simply get on, workout and get off. An elliptical like this will typically cost anywhere from about $150 up to about $500. You may find one even cheaper, and you may find one with a few more features that’s a bit above $500. But that will be your general price range when it comes to an entry level elliptical. Keep in mind that these trainers are not really built to last and the warranty that comes with it will reflect that fact. BRANDS: Brands in this category include Stamina, Exerpeutic, Sunny Health and Weslo, among others. WHERE TO BUY: You can find most of the entry level brands on sites like Amazon. Moving up you have your mid range ellipticals. These are the most popular home ellipticals, and they offer much more than the entry level options. They are ideal for more serious users, those looking to work out regularly, those looking for a more enjoyable workout experience on a better quality machine. You start to see more durability, more advanced displays, perhaps some incline capability, more built in workout programs, heart rate monitoring…many more features and capabilities than the entry level ellipticals offer. An elliptical like this will typically cost anywhere from about $700 up to about $1,900. Towards the lower end of this range will be the base models in a series, and towards the higher end will be the top of the line models. Yes, this is a pretty wide range but most mid range elliptical companies like to offer something for every budget. What can you expect towards the top of this range? Some of the features might include touch screen displays, wireless heart rate monitoring, increased incline, heavier flywheels, more resistance levels and workout tracking capability. As an example of this, let’s take a look at one of the most popular brands, ProForm ellipticals. 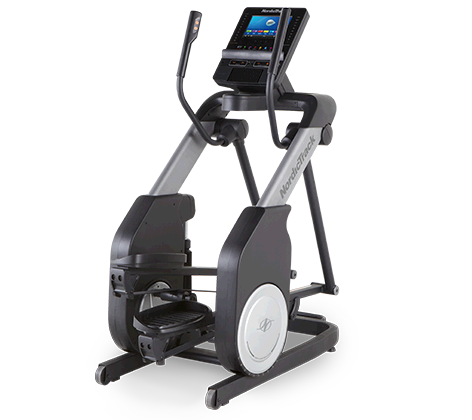 ProForm is considered a mid range elliptical brand, but they do offer an entry level choice that is around $599. The entry level Endurance 520 E has a basic 5″ backlit LCD display, 18 built in workouts, 19″ stride, 15 lb. flywheel and 18 resistance levels. The top of the line Pro 16.9 has an advanced Smart HD 10″ touch screen display, 35 built in workouts, 20″ stride, 32 lb. flywheel and 26 resistance levels. You also get a workout fan, wireless heart rate, a free year of the company’s iFit Coach program and a host of upgraded components. The Pro 16.9 cost around $1,599…so there’s a $1000 price difference between the base model and the high end one. So even within the mid range type you have a wide variety of options and price points. BRANDS: In addition to ProForm, in this category you have other popular brands like NordicTrack, Sole and Horizon. WHERE TO BUY: You can find most of the mid range brands on the manufacturer websites. The third category of ellipticals is high end, which are considered gym quality…these are home versions of the machines you find at a high end gym. The residential versions are very similar to their commercial counterparts…even identical in some cases. These ellipticals are for those who are looking for something a little more commercial grade, something more like what they use when they go to a gym. An elliptical like this will typically cost anywhere from about $200 up to about $5000 or higher. Just like with the mid range machines, towards the lower end of this range will be the base models in a series, and towards the higher end will be the top of the line models. It’s interesting to note that the difference between a base model and a top of the line model are not as cut and dried in the high end category as they are in the mid range one. Here you usually get an additional console option, a higher max weight capacity, an extra cup holder. Less noticeable increments, as the machines are top of the line to begin with…not much to improve as you move up in price. However, some high end brands do give you a lot more on the higher end models…but the price gaps are often outrageous. For example, Precor ellipticals are one of the most well-respected brands in the high end market. The base EFX 221 model gives you a basic display, three incline levels up to 25 degrees, 16 resistance levels and 10 preset workouts. That one costs just under $2,000. The top of the line EFX 885 model gives you a 15″ touch screen display, 20 incline levels up to 35 degrees, 20 resistance levels, 25 preset workouts and a warranty of lifetime frame, 5 years parts, 3 years console and 1 year labor. Sounds great right? But that one costs almost $11,000. So you’re talking about a $9,000 price difference between the base and the top of the line model. That’s pretty crazy if you ask us. BRANDS: In addition to Precor, in this category you have other popular brands like Life Fitness, Matrix and TRUE. WHERE TO BUY: Just like with the mid range brands, you can find most of the high end brands on the manufacturer websites. So How Much Should You Pay For Your New Elliptical? Now that you have a general idea of the price range for new ellipticals: $150 to $500 for entry level, $700 to $1,900 for mid range and $2000 to $5000 for high end, you can decide which category you fall under. Do you need something very basic for light, sporadic use or to rehabilitate an injury? Look in the entry level category. Do you want something a bit more advanced with more features and capabilities for frequent use, perhaps by more than one individual? Look in the mid range category. Do you want a commercial-quality elliptical like you find in the health club and is your budget more open? Look in the high end category. For a frame of reference, the most popular price category is $1,000 to $2,000, with right around $1,500 being the ideal price point. All of our top rated home ellipticals are in this range, as that is where you find the ideal mix of price and value. Your best bet is to stretch your budget as much as possible. The difference between an $800 and a $1000 can be substantial, and if you break that down by years of ownership, it might be an additional $20 per year and obviously well worth it. Also, keep in mind that you’ll often find special elliptical sales throughout the year, allowing you to afford an elliptical trainer that you may not have been able to without the discounts. So before jumping on a cheap elliptical just because you think that’s all you can afford, check out some of the sale opportunities first. Top brands like NordicTrack, ProForm, Sole, Horizon, Precor and Life Fitness often offer deep discounts during holidays and special events, and not just during Black Friday and Cyber Monday. You may just be able to get a $2,000 elliptical for close to $1,000. So start with a category and see what your options are within that category. Again, go a little higher in price if you can swing it to get the best elliptical within that category. You’ll be a lot happier with a $499 elliptical than a $199 one. Same holds true for the mid and high end ellipticals as well. Once you’ve chosen a category check out our top picks and read our reviews of the particular models. Then look for any current sales so you can save on the elliptical that you have chosen. Bottom line is there is no set price that you need to spend on your new elliptical…it just comes down to what you are looking for and what you can afford.